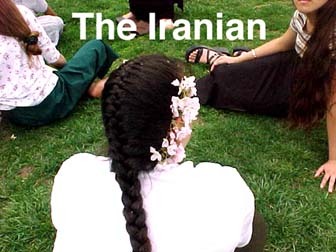 We all know how difficult it is to be an Iranian out of Iran. Take yesterday's "13 Bedar" in Washington DC, for example. It was celebrated not on the 13th day of the New Year but on the first convenient weekend. Was this acceptable to Ahura Mazda? Hope so. It's the thought that counts, right? And instead of a park in Tehran or a field on the outskirts of Shiraz or by the Karun River, you had to spread your sofreh by the Washington Monument next to a row of American flags. What can you do? Does it matter where you are? You have to adapt, I guess. There was plenty of chelo and kabab, some Persian books, boys and girls wearing Iranian national team T-shirts playing soccer, and a "Persian dance" performance. I couldn't help but think that all this was one big excuse, not to observe some watered-down ancient Persian tradition, but to experience something deeper: human ties. The most meaningful moments were lovers, friends and families talking and laughing. Even a simple exchange of glances with the one you feel closest to was worth a dozen seekhs of juicy kabab or fifty silly twirls by "Persian dancers".